Eurodollar trading volume is exploding, with no end in sight tools phenomenal growth. 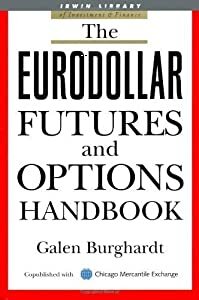 The Eurodollar Futures and Options Handbook provides traders and investors with the complete range of current research on Eurodollar futures and options, now the most widely traded money market contracts in the world. The only current book on this widely-followed topic, it features chapters written by Eurodollar experts from JP Morgan, Mellon Capital, Merrill Lynch, and other global trading giants, and will quickly become a required reference for all Eurodollar F&O traders and investors.